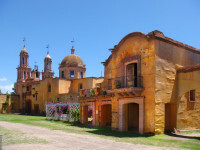 San Luis Potosí is also known as the "City of the Seven Neighborhoods", due to the division it had in colonial times. This mystical city is 417 kilometers (259 mi) northeast of Mexico City. San Luis Potosí is a city rich in nature, culture, arts, and cuisine, with centuries of history, since it had special relevance during the Mexican Independence and Revolution wars. Start by visiting the historic center, which is part of Camino Real de Tierra Adentro, an ancient trade route named World Heritage by UNESCO. In the downtown are is Fundadores Square, where you can see the statue of the patron saint of the city, San Luis Rey de Francia. An interesting fact is that San Luis Potosí is the only city in Latin America that belongs to the group of Cities of Light by the Lighting Urban Community International Association (LUCI), because of its lighted towers and domes. There is a kiosk at Plaza de Armas that was built in 1948 to pay homage to eight Mexican musicians, and also the cathedral, a Baroque construction covered with pink quarry. To the North of the square is the most elegant balcony in the country, at the House of the Viceroy Don Félix María Calleja. At Plaza del Carmen is the Temple of Our Lady of Carmen and only a few steps away is Alameda Juan Sarabia. Another attraction is the National Mask Museum, that houses an extensive collection of masks from Mexico, Europe and Asia. The is also Teatro de La Paz, a neoclassical-style theater built during the Porfiriato period. You can enter the Church of San Francisco, with a Baroque facade and stunning pictorial and sculptural works in its interior. 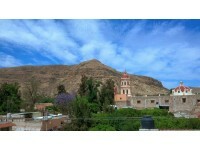 The Potosí Regional Museum houses a collection of pre-Hispanic pieces plus objects and paintings from the Viceroyalty. Walk the Calzada de Guadalupe, the longest pedestrian avenue of Latin America, which leads to the Colon Garden and to the Sanctuary of Our Lady of Guadalupe. Pass by Caja del Agua, a neo-classical building of the 19th century formerly used to store water. Other prominent museums in the capital of the state are the Federico Silva Museum, the first Latin American contemporary sculpture museum, opened in 2003; the Museum of the Viceroyalty, the Jesús García Corona Railway Museum, and the Francisco Cossío Museum, known as the House of the Culture of San Luis Potosí. In addition, the Tangamanga Park I, in the southwest of the city, offers a small zoo, a water park open seasonally, green areas with grills, and the Labyrinth Museum of Sciences and Arts; to the north of the city is the Tangamanga Park II, also with sports facilities, recreational areas, and a racetrack. In addition, on the outskirts of the city is Balneario de Gogorrón and the town of Santa María del Río, famous for its shawls made of silk. San Luis Potosí offers several shopping malls, such as Plaza San Luis, Plaza Citadella, Plaza Tangamanga, and El Dorado, or traditional markets as The Craftsman House of San Luis Potosí or the Venustiano Carranza Avenue in the historic center. The city features several festivals, such as the procession of silence during Holy Week, the National Fair of San Luis Potosí in summer, and the Festival of Light throughout the year. San Luis Potosí is also host to sporting events such as the San Luis Open and the Challenger International Tournament in March and April.